EARTH CITY, Mo. 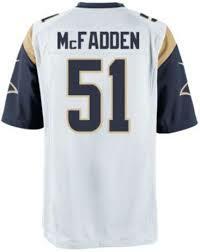 — In need of more depth at linebacker, the St. Louis Rams looked in-house to fill the roster spot vacated by receiver Austin Pettis as they promoted linebacker Marshall McFadden to the active roster Tuesday afternoon. McFadden, who signed to the Rams practice squad earlier this month, gives the Rams a sixth linebacker on the roster and could become a contributor on special teams. In adding McFadden, the Rams add someone to join a group that includes James Laurinaitis, Alec Ogletree, Jo-Lonn Dunbar, Daren Bates and Will Herring. Herring signed with the Rams on the same day McFadden joined the practice squad. Since entering the league as an undrafted rookie from South Carolina State in 2011, McFadden has appeared in five games, with most of that work coming on special teams. He has three career tackles in that role. The Rams also tweaked their practice squad Tuesday. They signed receivers Kadron Boone and Devon Wylie to fill the spots vacated by McFadden and receiver Emory Blake and released linebacker Denicos Allen to make room for linebacker Korey Toomer.